We visited Berlin’s Technology Museum for our son’s 6th birthday. 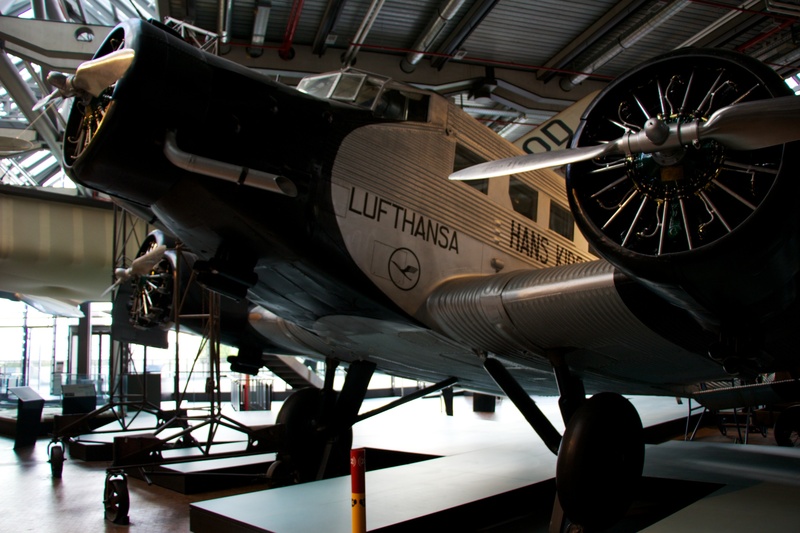 We only had time for the aeronautics section and the trains – but I had my aha moment, and the boys loved the museum. Travelling around Berlin today (on the S-Bahn from Alexanderplatz to Ostkreuz, and then on to Schönefeld airport for example), you see a lot of railway archeology – old shunting yards, signal boxes, engineering works – relics from a past where railways were even more important to the city’s life than they are today. 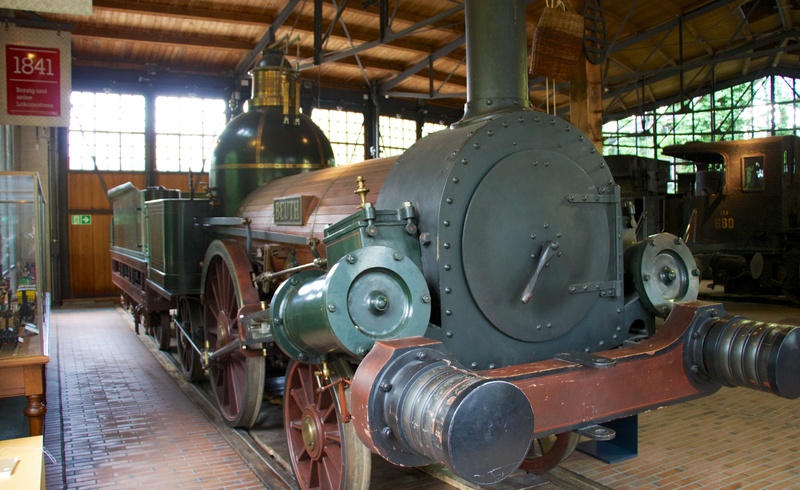 In the museum, it suddenly dawned on me why Berlin, home to the revolutionary Borsig locomotive works, was such an early adopter of rail transport – not only was it a sprawling city in itself, it was (and is) so bloody far away from anywhere! Look at places like the UK and the Netherlands – both used railways to their economic advantage (although the Netherlands was notoriously late) – but both had proven alternatives in the way of well-developed canal and stage coach transport links, and distances were small, anyway. But in the case of Berlin, located in the midst of the East-Elbian steppe, there was no such alternative. 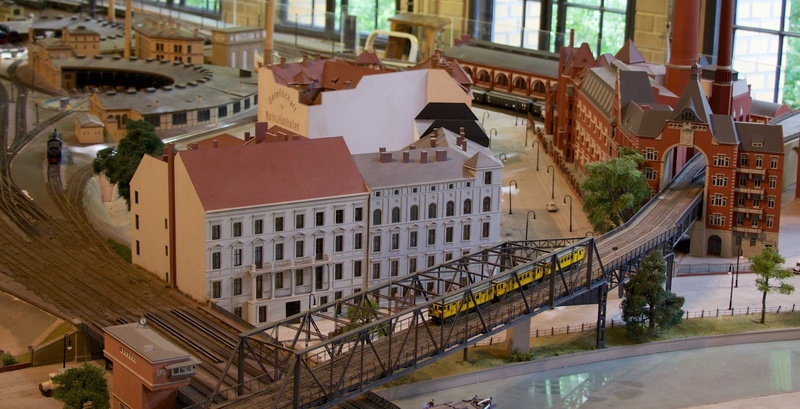 Besides economic activity (freight) driving railway building, it must have been political and passenger demand that led to such a huge railway infrastructure radiating from the Prussian capital. The legacy is here today: such was the rapid expansion of the railway system, and such was the continuous improvement technology and things like stations, that today there are lots of abandoned former railway stations turned into other interesting uses: parks (Nordbahnhof, Anhalter Bahnhof) or modern arts museum (Hamburger Bahnhof – built in the 1840s but already released from railway duty in 1884). And after the railways, history repeated itself in the early days of air travel: lots of aviation pioneers performed their flying experiments at Tegel and Tempelhof – again, not coincidentally, because the authorities were keen on entrepreneurs finding ways of breaking down the distances that separated Berlin from the outlying corners of the empire. Junkers Ju 52/3m or “Tante Ju” (Auntie Ju) – developed for parallel military and civilian use in the 1930s. Mainstay of German passenger aviation. I’m sure there’s nothing new in my ‘discovery’ of this – but for me at least it put Berlin’s five (at least) airports and heaps of current and abandoned railway stations into perspective. And it explains why Berlin has the material for such a great rail and air museum! Today is the 17th of June – and that used to be (West) Germany’s national day, until reunification came along. Why? On 17 June 1953, the first major people’s revolt against Eastern Germany’s communist regime took place. Soviet tanks came in to restore order. In the end, there were more than 100 dead, and many more sentenced to long stays in prison. All you can say for the Russians is that in those days, when they sent tanks into “countries in their sphere of influence”, at least they didn’t try to hide it. 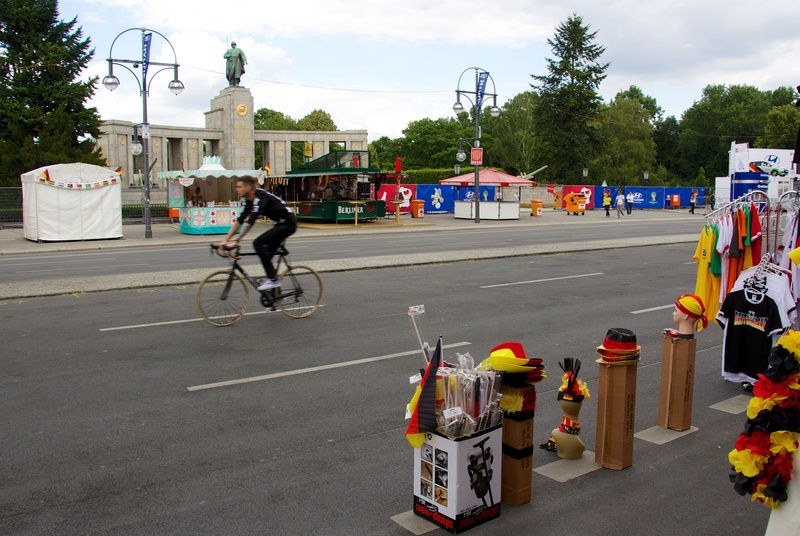 I decided to go and take a look if there was anything special going on at the Straße des 17. 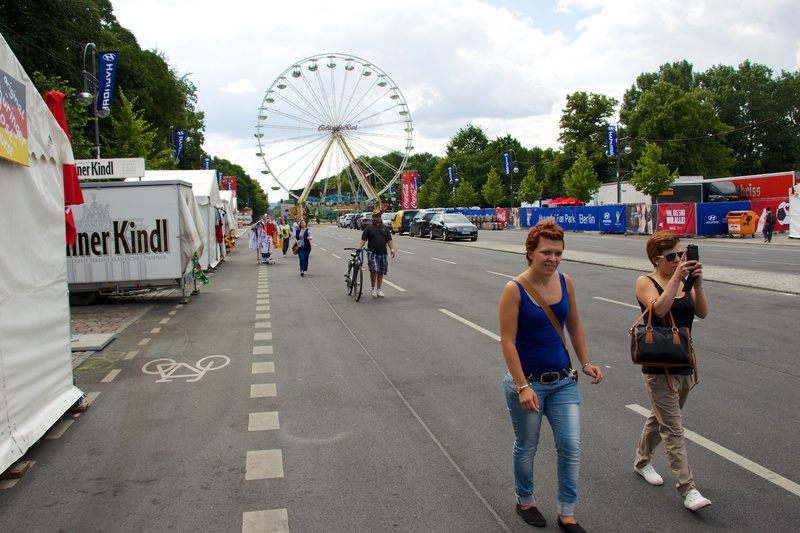 Juni (Street of June 17th) – the main East-West thoroughfare that is the extension of Unter den Linden. 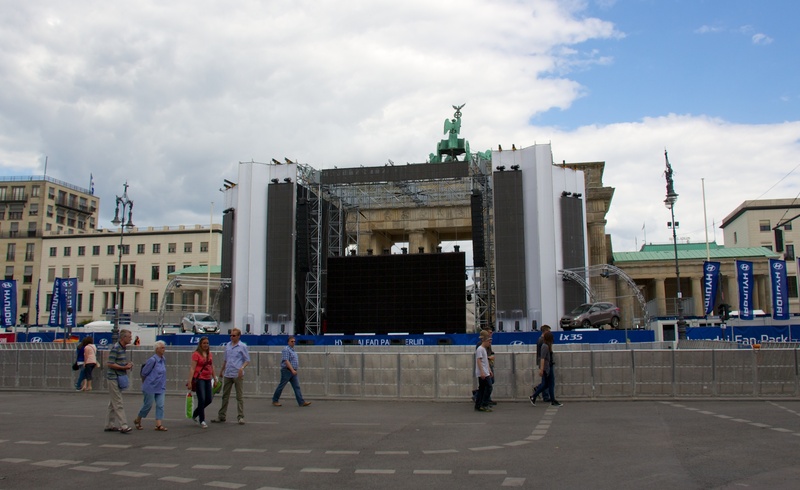 It runs from Brandenburger Tor, through the Tiergarten, past the Siegessäule and all the way to Charlottenburg. Ironically, and probably intentionally, the Straße des 17. Juni actually runs past two Soviet tanks – the ones that are mounted on top of the Soviet War Memorial. Today however, not much was visible of the tanks, or indeed the memorial, as the Straße des 17. 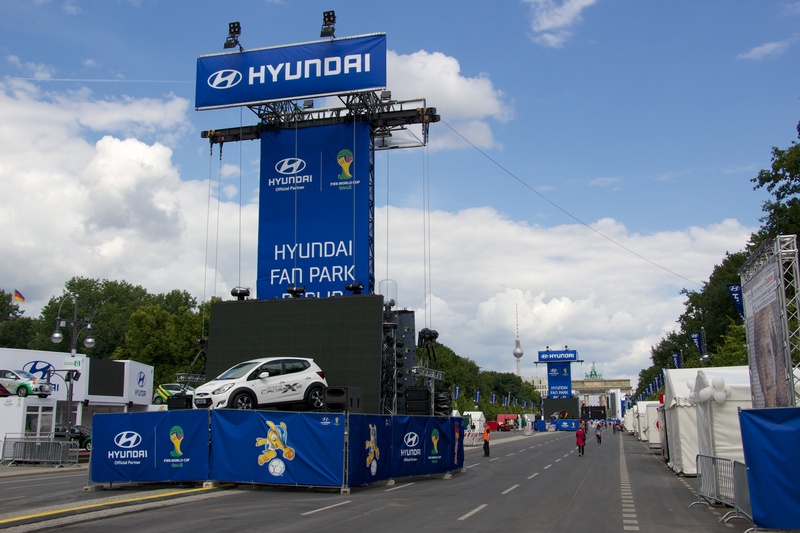 Juni is fully taken over by the Hyundai Fan Mile – a celebration zone for the Brazil football World Cup, complete with big screens, sausage vans and lots of beer outlets. Another Berlin locale linked to the people’s revolt of 17 June is the “Platz des 17. 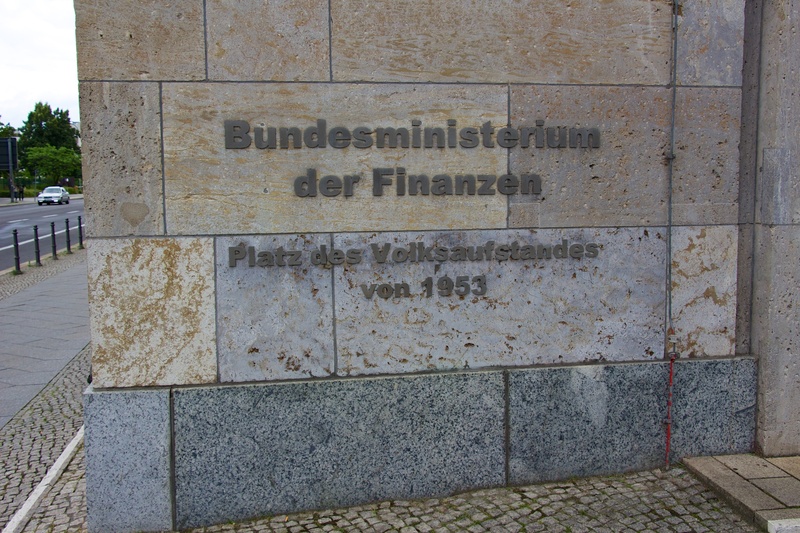 Juni”, actually the forecourt of the current Federal Ministry of Finance. In the GDR era, it was called the House of Ministries, and before that, it was Goering’s Airforce Ministry. This place, on the corner of Leipziger and Wilhelmstraße, is where the revolt actually took place, and where the official memorial is located. 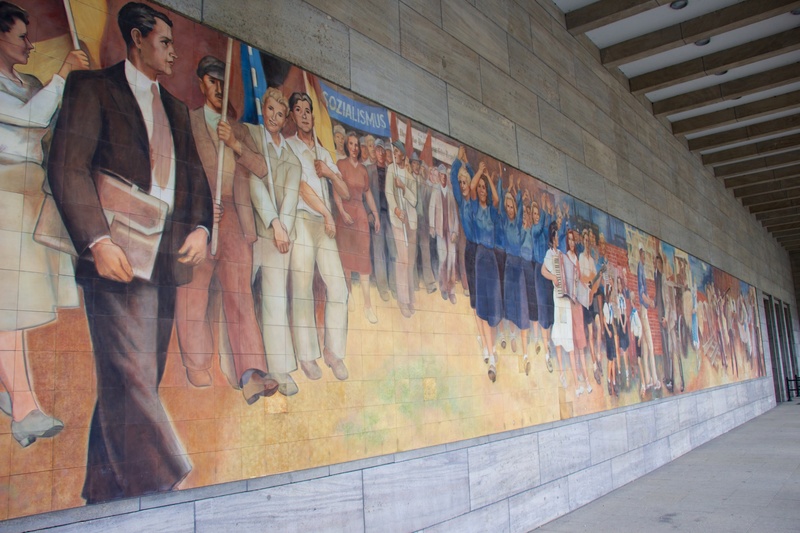 The revolt started when construction workers from Stalinallee (current Karl-Marx-Allee) protested against the raising of performance norms by another 10% – without additional compensation. One after the other, different sectors of the economy joined in the protests, until it all ended in tears. 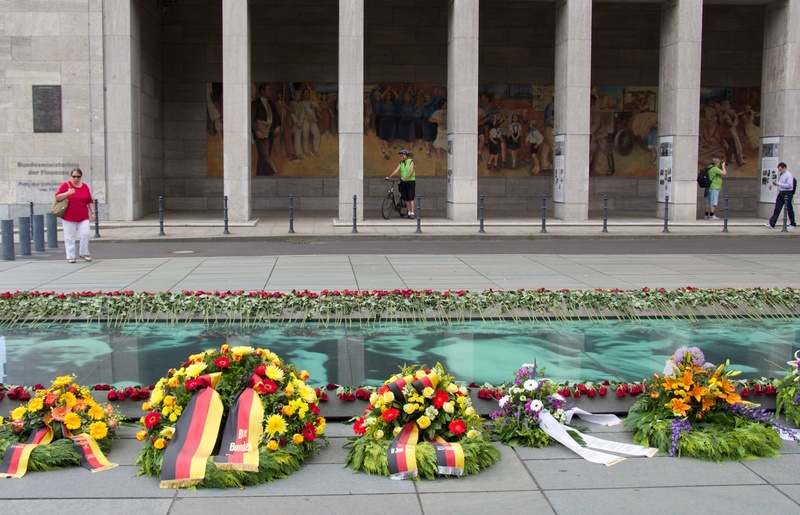 Wreaths and flowers are laid at the memorial every June 17th by Federal Government, Senate of Berlin, and political parties. Today, the 17th of June is not Germany’s national day anymore – that is now the 3rd of October, the day of official reunification. 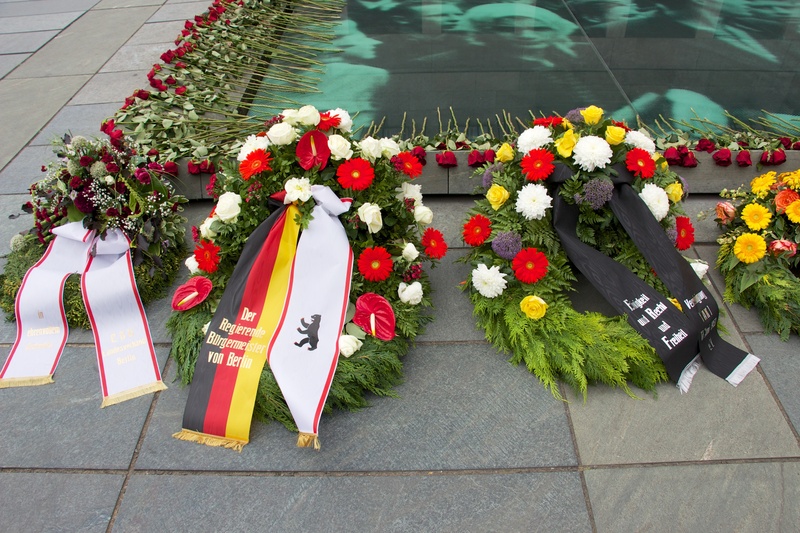 But the victims of the people’s uprising are still remembered, and honoured, at the memorial of the 17th of June. 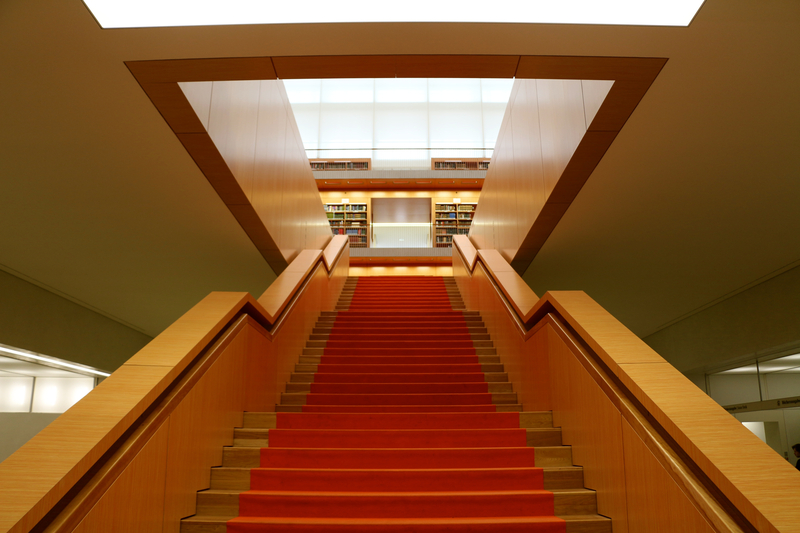 Happy and proud to mention that my latest piece, on the curious institution that is the Berlin State Library, got published on http://www.slowtravelberlin.com. As one friend mentioned, it’s amazing how the story of a country can be told through a library! Thanks, as ever, to Paul Sullivan and Beata Gontarczyk-Krampe, for their encouragement and editing support. A Hard Hat Day at the Opera – Berlin’s Staatsoper nearing completion. “But the word of the Lord endureth for ever.” Ikegaya’s Nested Churches at Berlin’s St. Elisabeth’s.